Energy Sistem, an electronics company based in Spain, recently announced two new ebook readers, the Energy Book 3050 (white) and the Energy Book 4050 Touch (blue). 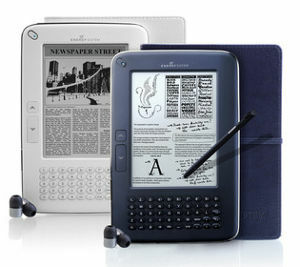 Both ebook readers feature 5-inch E Ink screens with 8 levels of gray scale. They are basically the same feature-wise, except the Book 4050 has a touchscreen that uses a stylus for on-screen notes and handwriting. They come with 1000 classic Spanish, English, and French ebooks, which ought to put a dent in the 512 MB of internal memory. But worry not! They come with a 4GB microSD memory card. And both models support Adobe DRM for EPUB and PDF ebooks. 8000 pages per battery charge. Mini QWERTY keyboard for adding notes, bookmarks, running searches. Built-in speakers and microphone; audio recorder. Plays MP3, WMA, and WAV audio files. Image viewer supports JPEG, TIF, BMP, PNG, and GIF. Text formats supported: TXT, HTXT, HTML, PDF, EPUB, and DOC. On-screen notes and handwriting compatible with TXT, HTXT, and HTML files (4050). At the time of this writing, the Energy Book 3050 is selling for €242.10 from Pixmania. The Energy Book 4050 is available for pre-order for €257.76 from the Energy Sistem website and says it will be available on 09-07-2010.